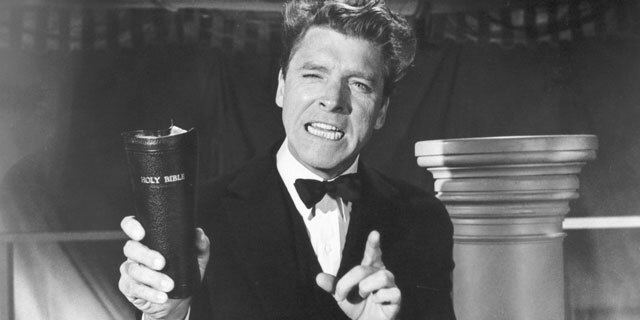 On the 50th anniversary of its release, many of the same issues addressed in Elmer Gantry, Richard Brooks’ 1960 adaptation of the Sinclair Lewis novel, are very much a part of the current debate between aggressive people of faith and the more secularly oriented segments of society. Front and center in the narrative is a display of Christian organization leaders engaging in shameless self-promotion, bitter turf battles, frenzied attempts to influence public policy and hypocrisy in the conduct of their personal lives which seem at odds with the person for whom their dogma is named. However, I think it’s interesting to note that unlike the works of celebrated contemporary atheists such as Richard Dawkins or Christopher Hitchens, Elmer Gantry ultimately honors the underlying religious principles that most of the characters observe only in the breach.